This miniature, a contemporary masterpiece rendered against a turquoise green background in the late 18th century Kangra art style, represents five-faced form of Lord Shiva usually known in the Shaivite tradition as Sadashiva. This representation almost exactly pursues the iconographic convention of Shiva’s Pancha-mukha form as it initially evolved in early sculptures which have four of his faces carved on all four sides believed to guard all four directions, and the fifth, above the other four skywards-facing. The representation is simply exotic for in miniature paintings the canvas does not have the stone's multi-dimensionality to portray four directions and to plant a fifth, above them. However, this miniature, reproducing a great masterpiece from Kangra in hill region of late eighteenth century, so manipulates the canvas that it imparts a strong sense of multi-dimensionality. Corresponding to his five faces Shiva’s anatomy has been conceived with ten arms, all carrying his one attribute or other : the right side hands carrying four – trident, thunderbolt ‘mustaka’ or heavy-blow-beat rod, sword and axe, the fifth being held in protective posture – ‘abhaya’, and the left, snake, noose, bell, goad and ‘damaru’, the double-drum. All five heads have their independent hair but in addition also a large basket-type massive ‘jata-juta’ – matted coiffure, cradling on it the fifth head. Except a snake carried in one of his hands merely as an attribute he has neither his usual elephant hide, tiger skin, serpents crawling on his body, skull-garland or anything revealing his ferocious form. On the contrary, in everything : from the iconography of his form – his large fluid eyes, sharp features, hair-style and the style o ear-ornaments, to his modeling and moonlike translucent body-colour, he reveals a strange feminine look. Instead of seated on his usual tiger-skin this sublime form of the Great Lord has been conceived as seated on a large double lotus installed on a beautifully inlaid hexagonal chowki in cross-legged posture wearing a delicately printed ‘antariya’ – lower wear, reflecting a sari’s look. 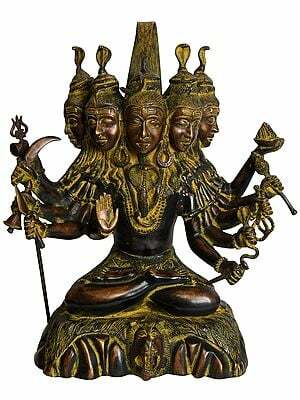 The figure reveals great benignity and rare divinity. The chowki, enshrining his figure, besides embedded with precious stones, has a high back and an umbrella canopying over Lord Shiva’s form, though like the entire Creation it also falls short of his expanse. A large bolster in maroon-red affording pleasant contrast to his figure’s pearls-like translucent white and his yellow ‘antariya’ is, like the lotus-seat, an element not usually represented in Shaivite iconography. In exact miniature tradition all five faces are in profile. The absence of his mount bull is noticeable. The form of his third eye has been conceived like an ornamental mark on the forehead, not like a feature that awed by its strange grotesqueness. 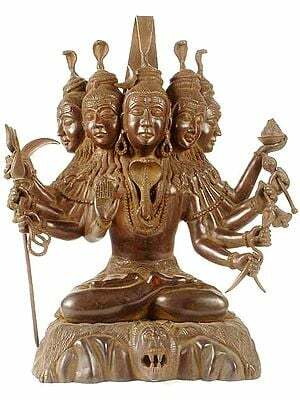 In Shaivite thought, Shiva is one of the Gods-Trio but also the ever present Sadashiva. 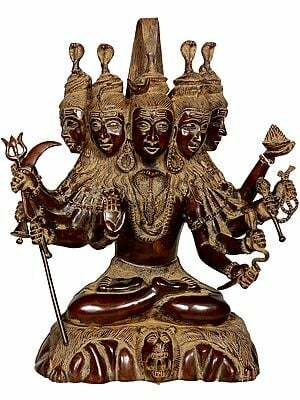 The Pancha-mukha cult has broadly two lines, though both accept that it is the manifest form of Sadashiva – the ever present Shiva. 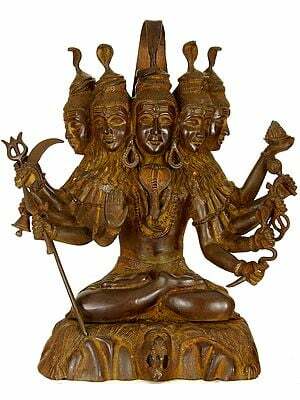 Under one tradition, it is in his ‘ling’ form that Shiva has his five faces and that it is the ‘ling’ which is his ultimate manifestation. The ‘ling’ is the ‘jyoti’ – the potential flame, which represents ‘pancha-bhutas’ – the five cosmic elements or constituents of the cosmos. Thus, it is out of him that the cosmos is born. The other tradition is not much different. 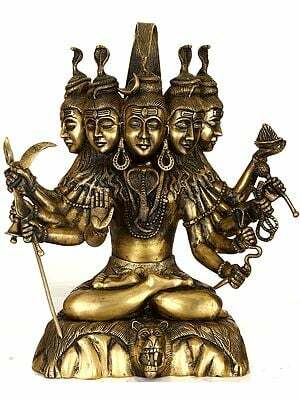 It conceives Shiva as Ishan, or as ‘Panchavaktramatrinetram’, that is, Shiva combines in him Tatpurusha, Vamadeva, Aghora, Sadyojata and Ishan, representing respectively the wind, the water, the fire, creative function, and the space. 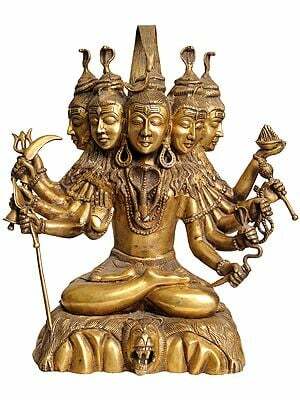 Thus again Shiva's five heads manifest the five cosmic elements and functions. Indira Gandhi National Centre & D. K. Printworld Pvt. Ltd.